Dandelion tea aids in weight loss. When trying to pinpoint Dandelion’s effectiveness as a weight loss product, one can’t fully trust the claims of brands or companies which offer a quick weight loss solution without examining the true properties of dandelion tea. The truth is, it aids in weight loss, but it is not a final solution for weight loss, either. Dandelion does the following: it is a superhero plant which prevents too much glucose assimilation (less sugar in the body), it helps digestion, and the contained potassium helps with diuretic weight loss. This yellow- petal flower grows abundantly in the springtime in many backyards and city parks. It makes its cultivation quite an easy and achievable task indeed. It gives a sort of herbal colon cleanse: it also contains substances that cure the body from metabolism disorders. The reason dandelion tea is so diuretic, is because Research from 1974 shows that the roots and leaves are natural diuretics. Unlike over the counter diuretics which can rob the body of potassium, dandelion stays true to Mother Nature’s perfect, non- chemical balance. 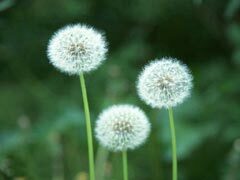 The substances in dandelion stimulate the stomach, livers and bile’s production, and this makes the body eliminate toxic metabolic products. So, dandelion tea weight loss is a bit of a myth. The diuretic action makes the body appear trimmer and slim, thanks to the excess water and toxins being flushed out of the body. But dandelion tea would never really speed up metabolism, or actually melt any fat layers already within the body. When there is a desire to find ways to speed up metabolism, one should turn to other complementary substances which speed up that metabolism. For example, citrus peel, and ginger are known to boost the body’s heat and create a thermogenesis which speeds up the metabolic process. The quick rundown on ways to speed up metabolism is drinking green tea, eating small frequent meals, doing cardio and resistance exercises, getting eight hours of sleep, using caffeine in moderation, and eating spicy foods such as jalapeno and cayenne peppers. There are no quick fixes when it comes to increasing metabolism or weight loss, it has to be incorporated as a lifestyle choice, and people must stop living in the state of a quick fix. In order for the body to see metabolic results and slimming, the individual will have to balance their lifestyle and use all the weapons they’ve got.